I always knew those historic little hotels and inns I see in most every small town in America were a lie. Built anywhere from the 18 to the early 20th centuries, they're clearly designed, like fossil birds, t o distract us from our faith in God. Nobody back then knew how to lay bricks, or "devil's building blocks" as they were then known. Are you feeling alright, hugo? I didn't say there weren't inns, or grand hotels, only that for the ordinary OFG a rooming house was more of an option financially. Some days, ol' Hugo just feels like busting on somebody. Today must be one of those days..... and you just kinda got in his way. Don't take it personally. Motor cars were quite common as taxis in this time period and were decidedly edging out the horse drawn hacks in large cities. In 1914, during the Battle of the Marne, faces with the difficulty of moving men quickly and easily, the French requistioned the Parisian taxis. There were taxis In big cities although small town likely would have jitneys. Automobiles weren't very afforable for most people until the Model T and even the the infrastrucute (good roads, gas stations, repair shops) didn't really get established until the late teens/early 20's. Yes there were the Marne taxis. Being French, and being vitally neccessary for the defense of Paris, the entire world must have wondered why the cabbies didn't walk out on strike. I’m just a critic. You gave me a lot of material to work with. Del is partly correct and partly incorrect, a pretty good model for the human condition. Nothing personal. Think of me as a heckler, preferably in the voice of that Paul the Llama thing Bob posted. The human equivalent of somebody throwing paper airplanes or jostling the professor. Also, in my experience, the OFG was every bit the swindler, liar, fornicator, thief and card cheat as the modern gentleman, he just smelled worse and was usually more poorly educated. Ain't nobody boiling water in 1918. Too damned luxurious. Hot water heaters, dude. Turn a faucet and getting hot water is a luxury still in many parts of the world. You need to get out more, friend! You're right, Champ. Parents were never afraid for the welfare of their children prior to 1918. I didn't say they weren't, but Leopold and Loeb sensationalized the horriffic crime and the media spread it far and wide. Kind of like the way 9-11 changed the way the public looks at terrorism. Leopold and Loeb were the first "Crime of the Century".... although there was a lot of century left, and a lot more notorious crimes to surpass it. Charles Manson, for example. As cultural decay goes, Leopold & Loeb were early examples of Freud & Nietzsche's influence entering the mainstream. In 1918, it was unthinkable that sexual thrill-seeking was offered as an excuse for their actions.... and how they felt like they were above the law, because of their sociopathy (superior intelligence and depraved will). We have come to expect this now, from celebrities and political leaders and the perpetrators of sinister crimes. We forget that is hasn't always been this way. You need to stop glossing over things, man. You said hot water. Not heaters. Not out of the tap. You said hot water. You do know I’m teasing, right? Not particularly “1918,” either. But I learned something. And today we're racing to the future at breakneck speed. Wasn't that written by a female? OFL, maybe? In 1918 none of this was old fashioned. Where were you when chuckleheads were insisting that life in the Middle Ages was unsophisticated, primitive, and even savage? Watching you get your arse kicked. 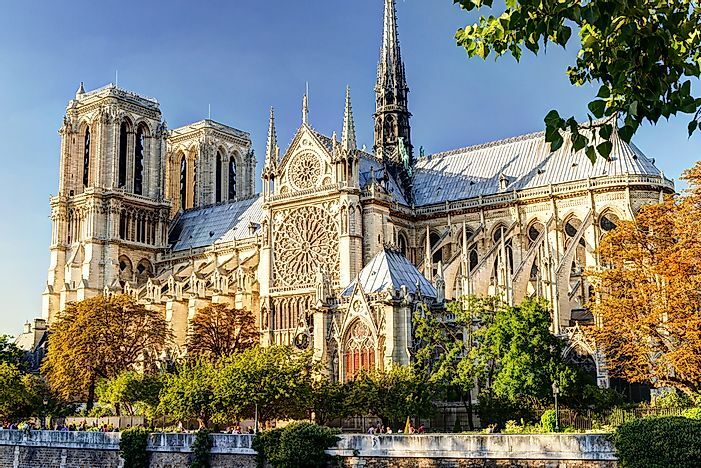 I don't think modernity could manage a long-term, forward-thinking project so grand and beautiful as the Notre Dam Cathedral. But we sure can kick arses on Twitter! Begun at the end of the 19th c., construction ongoing. I just spit tea on my shirt. Also, Hov, was genuinely only screwing around. Jim hit it for me—I think I goof on threads like this because the Old Fashioned fellow considered himself cutting edge. I’ll stop now. When did the Spanish Influenza Pandemic break out? I am pretty sure my grandfather survived the Spanish Flu (barely) at Camp Gordon in 1918. You would argue with a rock, wouldn't you. In Western PA, we say tree stump. Rocks are used to settle arguments. I was wondering what they'd been up too.